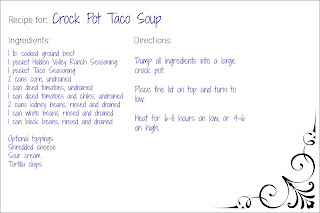 Mothering with Creativity: Delicious (and super easy) Taco Soup! Delicious (and super easy) Taco Soup! Yesterday I tried out a Taco Soup recipe in my crockpot. 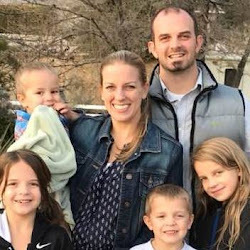 I am always looking for good recipes that are easy to throw together (and by "easy" I mean "less than 5 minutes"). 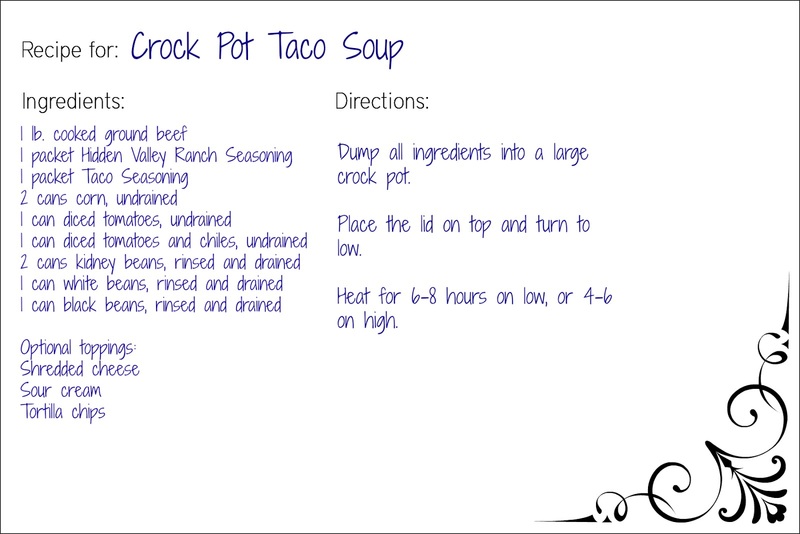 I ran across this taco soup recipe on THIS awesome crockpot blog. Anyway, it turned out amazing! My husband loved it (which is always the deciding factor for my "regulars" on the menu). After having 2 separate people ask me about my lunch today (the leftover soup), I figured I'd blog the recipe! This took me a little longer than 5 minutes to prepare because I cooked up 3 lbs of ground beef at once so I could freeze a few portions for later (see my post on Doubling it Up!). Other than cooking up the ground beef, all this recipe requires is opening cans, dumping them into a crockpot (or a large pot would work, too), and letting is cook! Easy! Add 1 pound cooked ground beef to the crockpot (or chicken or turkey). Sprinkle 1 packet each of Hidden Valley Ranch and taco seasoning on top. Pour in 2 cans corn (do not drain! ), 1 can diced tomatoes (undrained), 1 can diced tomatoes and chiles (undrained), 2 cans kidney beans (rinsed and drained), and 1 can white beans (rinsed and drained). Stir. Cover and cook on Low for 6-8 hours, or high 4-6. My crockpot cooks on the hot side. We ate ours after just 3 hours on High. I did read, though, that this recipe tastes better when cooked longer. So, if you remember to put it on in the morning, that would probably be better. We topped our soup with crushed tortilla chips, sour cream, and shredded cheese, and then served it with yummy homemade cornbread. Enjoy this super easy and tasty recipe! I will be keeping these ingredients on hand for that "I don't want to cook but want something warm and tasty" day. Enjoy! Click below to print a recipe card!